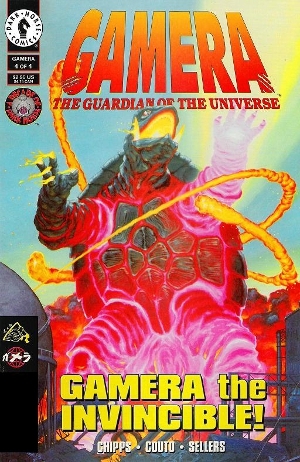 This, the sixth Gamera film, (released in the U.S. as Gamera vs. Monster X) is really the third part in a Pentalogy that ends the series, all following the same basic outline. 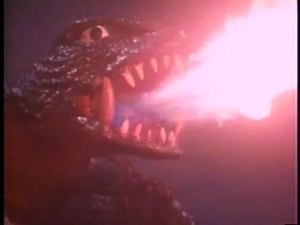 A New Monster arises, Gamera loses his first fight, and spends half the movie down for the count as the Military/Scientific/Industrial Complex fails to combat the latest kaiju threat. A pair of Annoying Kids (one Japanese, on Token Anglo), Designated as Our Duel Protagonists, take it upon themselves to deal with a human-sized problem, and their plucky spirits rouse Gamera, Friend to All Children, from his mid-movie stupor. He wins the Climactic Battle as the Kids watch from Minimum Safe Distance, ruining the fun for everyone with their high-pitched color commentary. Cue credits. I’m sure you’ve seen this before in a hundred thousand “History of Special Effects” documentaries. Well, too bad, because 90% of the movie is…something else. Columbia Pictures should give us all hope that we can rise above our station in life. This little Poverty Row studio, which made a name for itself producing comedy shorts in the 30s (including The Three Stooges’ most famous works) had, by the mid-50s, replaced RKO as a member of the Big Studios Club. With everything from Superman cartoons to Marlon Brando Oscar winners in their catalog, its seems only natural Columbia would try to field a giant monster movie for 1955. You have to give them credit for going about it the right way – hiring two of Them!‘s writers and a man (now) more famous than either of ’em – the stop-motion animator behind The Beast from 20,000 Fathoms, Ray Harryhausen. 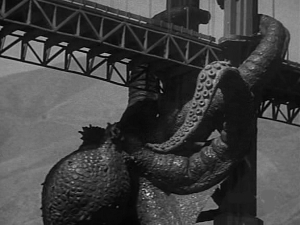 If this film’s remembered for anything, it’s remembered for Harryhausen’s effects. This is the mid-point between his career-defining turn in Beast and the next year’s State of the Art showcase, Earth vs. The Flying Saucers. But Art doesn’t come cheap, so I shouldn’t be surprised all of Harryhausen’s contribution’s are crammed into the film’s last 15 minutes. I was. Unpleasantly so. But I shouldn’t have been.